The thing they have in common is that none of these workers have permanent working arrangements. And most will only be engaged with a company for a short period of time before moving on to their next assignment. So why would a business invest in onboarding a worker that is not going to stick around for very long? Let me give you 4 really good reasons. Not having your paperwork in order or neglecting to educate your contractors in basic legal and policy requirements could land you in hot water with the law – or at the very least in messy disputes with other businesses or workers. You cannot assume that your contractor understands their rights and responsibilities whilst working with your company. Every worker should be educated in policies and procedures relevant to the industry and situation, particularly where health and safety is at stake. While a construction worker will undertake similar bullying and harassment training to a financial services consultant, each will have their own very specific induction needs. In addition to compliance type training appropriate levels of other training should be built into contractor onboarding. Sometimes contractors are hired for their particular expertise (eg consultants) and won’t require training in the technical aspects of how to do their job. In contrast, low skilled or unskilled contractors are going to need a lot of input and direction from their manager in order to be productive. To hit the ground running, a contractor needs to quickly come to grips with how the business operates (structure and strategy), who they report to, and recognise which stakeholders have a vested interest in the work they have been engaged to complete. Effective onboarding activities can ensure your contractor connects with the right people faster. Having regular access to their manager and other seasoned employees to discuss and resolve issues along the way will also help the contractor navigate any tricky politics and cultural sensitivities. Too many contractors are given very little guidance and direction, leaving them to sink or swim. This is time wasting and counterproductive. Setting performance goals and meeting regularly with their manager to specifically address performance will ensure the contractor focuses on the right things and achieves desired outcomes faster. Finally, like any human being, the contractor has a basic need for acceptance and inclusion. Invitations to social events or even offers from co-workers to have lunch or grab a coffee can help a contractor feel part of the team and more engaged in the work they are doing. Effective onboarding will accelerate your contractor’s progress, and result in better outcomes faster. But remember, a temporary machine operator filling in for 3 weeks will have very different needs to a Project Manager looking after a multi million dollar IT project over the next 2 years. Be smart about it. Select your priorities carefully and invest your onboarding time and money wisely. 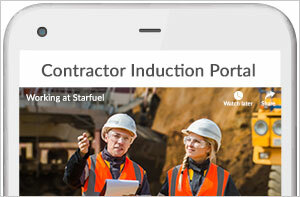 Reduce the cost of induction and onboarding for contractors. Get this free guide to creating an onboarding process for your contractors. A list of essentials for WHS.